I’ve started mixing sweet with savory just for the thrill. It’s taught me a lot about food, made me a bit more adventurous, and aids me in cooking. With a recent bounty of figs I knew I had to come up with a few new creations before the figs went to the great fig tree in the sky, i.e. went bad. Working on something sweet, I originally made a fig sauce for dipping chicken into or pouring over fish, but the moment I tasted it I knew: This sauce was born for charring pork. My buddy tasted it and said “It’s good,” and then proceed to dunk a grilled chicken tenderloin into it. “Mmmm!…Yeah, okay,” he said while still chewing. “It would be best with pork.” Yes, padawan. I know. Throw everything into a sauce pot and cook down over medium high heat until it’s reduced by at least a third to half. It’s going to be pretty thick. Set it aside to cool. While the sauce was marrying post simmer, I took two gorgeous, thick-cut bone in pork chops, about 6-8 ounces each, rinsed them, and patted them dry. Once the sauce cooled a bit (you can make this sauce a few days in advance if need be and keep it in the fridge in tupperware for 3-5 days) I blended it with an immersion hand blender, you can also use a potato masher. It’s fine if the sauce is still pretty chunky. I then slathered the chops with the fully cooled sauce and let them sit at room temperature for 20-30 minutes. These were thick and needed to come to room temperature before I through them on the grill. I operate on one speed: Fast. The also means that I generally cook on one temp: High. I preheated my grill, cleaned the grates, and slathered the pork just a bit more and cracked fresh black pepper over them before putting it on the grill. Now these chops were about 1 1/2 inches thick, so they had to cook a while, and though I wanted a char, I didn’t need dry pork. No one needs that. After 4 minutes on one side my friend gave the chops a quarter turn and left them for another 4 minutes. We dripped a bit more sauce on the top and topped with black pepper again prior to flipping them and lowered the burners to medium-high. After about 4 minutes, there was a quarter turn and they were done two minutes later. You want your pork to register at 145 degrees – YES, this is safe – and remember that as it rests, it will continue cooking a bit. The sauce and char makes ’em! 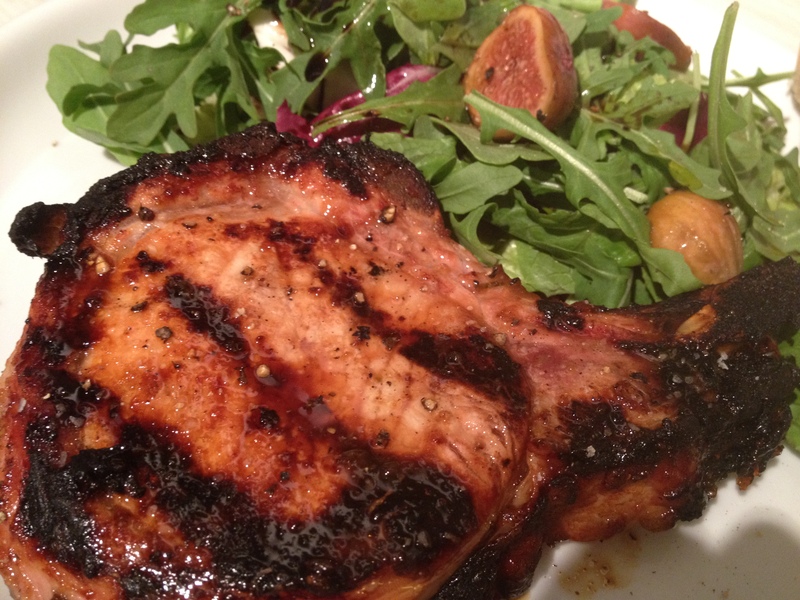 This entry was posted in Entertainment, Food, Recipes and tagged atkins, carb free, diet, dinner, dinner party, easy, exciting, fig, flavorful, food, foodie, grill, guests, paleo, pork, pork chops, quick, savory, summer, sweet, tenderloin.